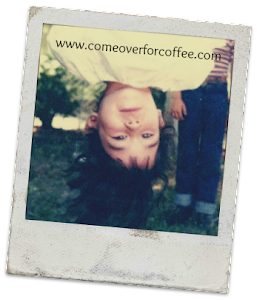 Come Over For Coffee - We'll Talk: I'm Making Me Crazy! This is not the post I thought I would publish this week. But that’s ok.
Last night, our evening went off in the ditch. Nothing happened like it was supposed to. I’m supposed to be strong enough to handle the unexpected stuff of life. And sometimes I am, but last night I cracked. I texted my husband to come home from the meeting he was attending to help me deal with the crud life was handing me at the moment. Together, we dealt with the stuff that was going on. This morning, I’m continuing to clean up the mess that life handed us. I had today all mapped out. And it’s not going at all according to plan. And that’s making me grumpy. I’m doing what needs to be done, but I’m really annoyed about it. And how is my attitude is playing out? I’m ignoring God. You heard me right. I’m frustrated with what He let happen last night, so I’m being petty and ignoring Him. My Bible and Bible study notebook are sitting on the dining room table. They are just waiting for me to sit down and have some time with the One who loves me and only wants the best for me. But I’m ignoring Him. It makes absolutely no sense. I know that time with God restores me. I know it brings peace and fellowship with the One who knows me best and loves me most. But I’m resisting. Because being petty is self-centered. Being selfish and having a pity party gives me license to mope, feel sorry for myself, and pout. Time with the Lord is going to expose my selfishness and turn my eyes to Him. It’s going to open my eyes to my petty behavior. Then I’m going to have to decide to confess my behavior or not. And I’d rather enjoy my pity party a bit longer, I think. As I type this, I know I’m making a stupid choice. I’m confessing to a public audience instead of sitting down in private with God. I’m actually shaking my head at my own foolishness. Because maybe my struggles with my attitude, reality vs. expectations, and taking it all out on God will help someone who reads this post. Maybe it will be an encouragement to know that you are not alone in wishing life would follow the script you wrote. Maybe it will help to know that you aren’t the only one who gets mad at God when life goes off in the ditch. And maybe being reminded that time with Him is the only cure for life’s curveballs will send you – and me – back to Him, where we belong.